1. Video and Audio Posts. Have you ever wished you could talk to Moodle the way you talk on your smart phone? A new feature of Moodle 3.6 allows you to do just that. Here is how. Open the course you are taking, and then open Forum: a place to discuss Unit (pick a unit in the course where discussions are taking place). Next, decide whether you want to start a new line of discussion or just add comments to an existing line of discussion. Open a box for your message. In the icons at the top of the message box, click on the microphone icon to record an audio message or on the video icon to post a video. The limit for both is two minutes, which will help you practice being concise! These features have been tested in a variety of browsers. They work well in up-to-date versions of Chrome and Safari, but the technology is not supported by Internet Explorer and may not work in all versions of Microsoft Edge. An Important Note about Preserving Privacy: As usual, Moodle will automatically email your audio or video forum posts to all course participants who are subscribed to those forums. However, recipients of these emailed versions of your multimedia posts will not be able to watch or listen to them in their email inboxes. This feature preserves the privacy of the participants in the course because the individual must type in a valid log-in to access the content. Of course, you are free to blog on social-media platforms about your own ideas and opinions or your learning experience in general, but personal information—including all posts made by other course participants—should never be shared outside the course without explicit permission from all persons involved. 2. The Multifaceted Dashboard. The Dashboard itself is not new, but Moodle 3.6 gives you options not available in earlier versions of Moodle. Dashboard Left-Hand Column. In the left-hand navigation column, click on Dashboard (top left) to open it. If your screen only shows two columns you will need to click on the Hamburger icon to open the left-hand column. Dashboard Center Panel. The center of the Dashboard lists your courses. Using the drop-down box on the right side of the center panel, you can set the display of your courses to one of three options: List, Card, or Summary (a list with details). These choices are especially useful if you participate in more than two courses per year. Try all three to see what fits your needs and learning style best. The Card choice sometimes shows graphics or photographs and sometimes blocks of color, with the titles of the courses underneath. 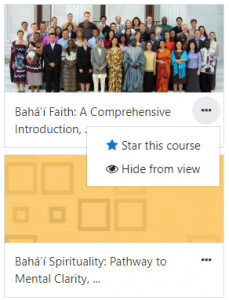 To star (or hide) a course, click the three dots to the right of the listing and select the relevant option. The List choice is displayed below. 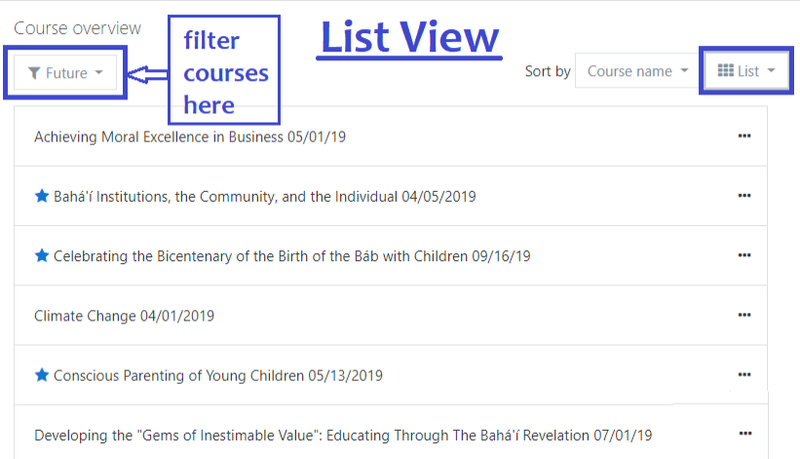 If you have taken quite a number of courses over several years, you can use the Course Overview button at the top left of the center Dashboard panel to narrow the list that shows up on the Dashboard. Your options include: All (which is the default view), In Progress, Future, Past, Starred, and Hidden. Forums and Resources: These two choices appear in the Activities block. 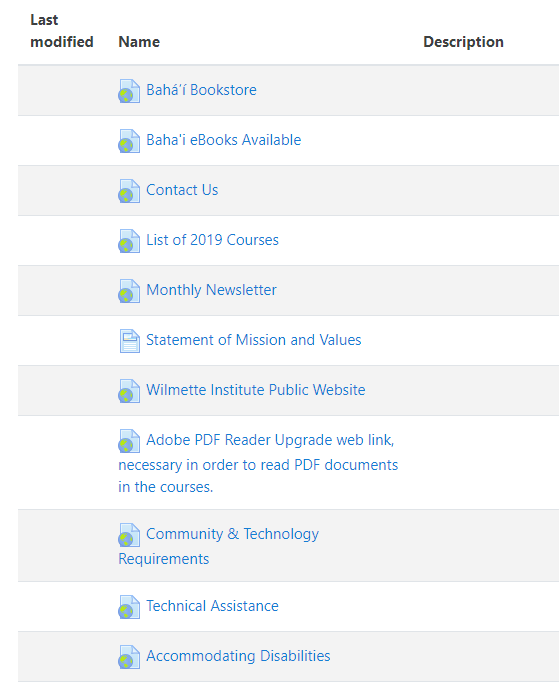 In Resources you will find, for example, links to Moodle tutorials, the Bahá’í Bookstore, Bahá’í eBooks, the Wilmette Institute’s monthly newsletters, and documents regarding its support services. Latest announcements: Here you will find news about upgrades, site downtime, and special events. Private files: In the Private files section, you can upload files on which you are working or anything you want to park someplace—perhaps a favorite piece of music or a prayer you are memorizing. Word documents, PDFs, PowerPoint presentations, and most music and video files are all uploadable. Your Dashboard will hold up to 100 Megabytes (Mbs) of files. As a guide, a typical music file takes up about 1 MB; documents and PDFs are often much smaller. Customizing Your Dashboard. With Moodle 3.6, you can customize your Dashboard. Click on Customise this page (top right side). Then click and drag the blocks to where you want them. In addition to the default blocks on the Dashboard, you might like to add a Comments box and a Tags box. To add either of these blocks, first click on Customise this page at the top of the right-hand column. Then, in the left column, scroll to the bottom to find Add a block. Click on that link, which will give you a number of options. Some options are not active and will give you an error message. Comments and Tags are active. 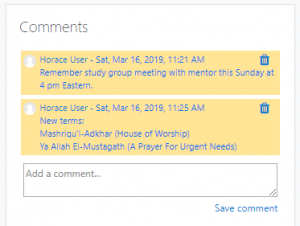 Comments: You can use Comments to display anything you like: personal reminders, names of books you want to read, topics you want to research, unfamiliar terms about which you are learning, and Bahá’í words and names with the proper accent marks for copying and pasting into the Forums. Tags: Click on a tag in the box (below left), and you will see a list of the Moodle users who have chosen that tag as a hobby or interest (below right). 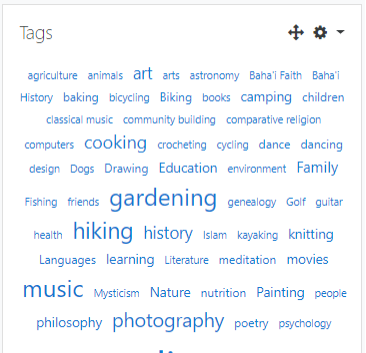 You can then add the tag to your own profile, by clicking Add “[interest]” to my interests. 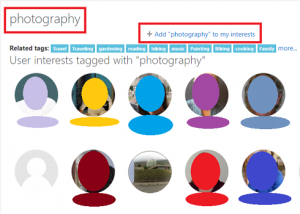 Tags can also be added when you create or update your profile. 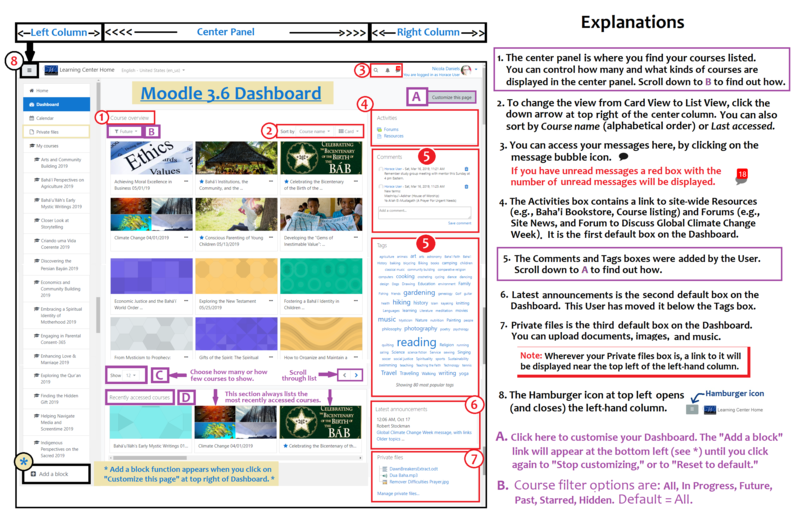 Extra Help for Navigating the Dashboard in Moodle 3.6. If you are still having a bit of trouble seeing how the elements of the Dashboard in Moodle 3.6 work, click here to view the entire Dashboard page: annotated screenshot of a typical Dashboard (Comments and Tags boxes added). The numbered and lettered Explanations guide you through the many choices. 4. Searching for That Forgotten Post in a Forum. A fourth feature of the updated Moodle is that you can easily retrieve materials from past Wilmette Institute courses you have taken. For example, you are preparing a deepening project, and you find yourself trying to remember a quotation, an article, or a book title from the course. Or, even worse, you cannot find or have lost your notes and downloaded materials from the course. Do not panic. You can go back to the course to find what you need. If you have forgotten your password, email the Registrar (learn@wilmetteinstitute.org), and ask for a temporary password so that you can log in. At the top right side of your course’s Classroom page there is a link to Forums. Clicking that link takes you to a page that lists all of the forums in the course, including the Course Lounge and the Create a Personal Learning Plan forum. At the top right side of that Forums page is a Search forums box. 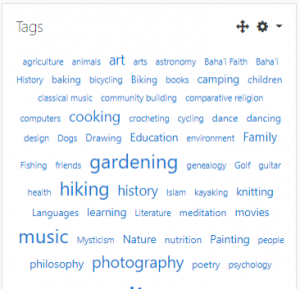 You can do a basic search with one or more keywords by typing them in the Search box. If your search terms are unique, they may be all you need to find what you are looking for. If your search returns too many results, you can access Advanced search options by clicking on the search button without typing anything in the search box. And Yet There Is More. A participant in a course recently asked for advice about downloading course materials for personal use. A quick way to access the articles, compilations, and book extracts in a course is to scroll to the bottom of the Classroom page. There you will find Bibliography (which may be part of the course’s Grace Period). The Bibliography contains links to all of the course’s resources (except its videos). As a general rule, you are free to download and use any course materials, including videos, for your personal study or for preparing a presentation for friends in your local community. Exceptions to this rule include course-specific webinars or lectures and video chat sessions. If you would like to share someone else’s comments or personal project, please ask that person for permission. Some personal projects are published on the Wilmette Institute’s public website. No permission is required for sharing these published projects in your community, as long as you credit the source of the project and do not alter the project in any way. You may also link to the Wilmette Institute’s published learner projects, but you may not re-publish them without permission or post them on a commercial platform.